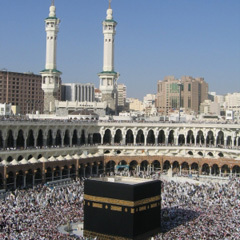 In the last ten years, we have specialised in offering people Hajj & Umrah packages from the UK. We offer pilgrimages to Saudi Arabia for these rites of passage at prices ranging from budget to prestige levels. Hajj is a pillar from the pillars of Islam, and a unique opportunity to seek Allah’s forgiveness and make a fresh start. Our Hajj package include lectures, international and domestic return flights, and meals during the Hajj rites. The lectures are conducted by persons qualified on Hajj and related subject areas.